Femtosecond laser ablation in liquids offers a convenient method to prepare periodic nanostructures. Many processing parameters and diverse liquids make it possible to flexibly manipulate the nanostructures created in terms of their periods and directions. Laser induced periodic surface structures (LIPSS) can be classified into low-frequency LIPSS (LSFLs) and high-frequency LIPSS (HSFLs) according to their periods. The periods of LSFLs are close to or slightly smaller than the laser wavelength, while the periods of HSFLs are much smaller than the laser wavelength. As compared to ablation in air, LAL is more prone to generate HSFLs. In most of previous reports, silicon HSFLs were produced at the laser fluences near the ablation treshold of 0.1 J/cm2. In contrast, little is known about the distribution and the orientation of HSFLs on the microstructures obtained by laser ablation in liquids at high fluences. The research group of Prof. Koji Sugioka from RIKEN, Japan, developed silicon hierarchical microstructures fully decorated with HSFLs by femtosecond laser ablation in liquids (water and acetone) at a high fluence of 1.7 J/cm2 (457fs，100kHz，1045nm，600mW) and realized a fine manipulation of their layout on microstructures. The periods of Si HSFLs are in the range of 110-200 nm, independent of scanning speed, scanning interval and liquid composition. 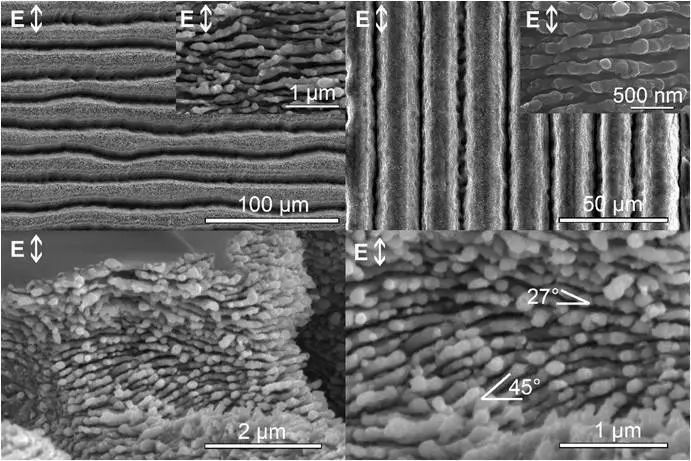 The microstructures obtained include microgrooves and mountain-like structures. Since the orientation of HSFLs is generally perpendicular to the polarization direction of laser light, the orientation of HSFLs can be easily adjusted to be parallel or perpendicular to that of the microgrooves by changing the scanning direction. It is interestingly found that on the mountain-like microstructures with height gradients, the orientations of HSFLs are no longer strictly perpendicular to the polarization direction of laser light but tilt clockwise or anticlockwise with a maximal value of 50°, different from the traditional cognition. Through multiple measurements including XRD, SEM, TEM and Raman of the obtained nanostructures and nanomaterials, together with the comparison with the results from laser ablation in air, this work confirmed that a moderate melting during laser ablation in liquids and the superfast cooling facilitated by liquid environment were beneficial for the formation of HSFLs. The hierarchical microstructures fully decorated with HSFLs presented in this work offer more choices for silicon-base applications and may inspire further investigation on LIPSS-decorated hierarchical microstructure development on different materials. Prof. Koji Sugioka group from RIKEN Center for advanced photonics (RAP), Japan, is devoting to the study and development of laser processing technique to realize environment-friendly, high quality, high efficiency material processing. In particular, his group intends to use high fluences of ultrafast (picosecond and femtosecond) lasers to realize innovative material processing that is unavailable by other traditional techniques. Currently, the research fields of his group include three-dimensional, high aspect ratio, high quality nanostructuring, development and application of biochips and photoelectronics. Prof. Koji Sugioka is a Team Leader of Advanced Laser Processing Research Team in RAP, RIKEN. He is a member of board of directors of Laser Institute of America (LIA), the International academy of photonics and laser engineering (IAPLE), Japan laser processing society (JLPS), and Japan Society of laser technology (JSLT), a fellow of SPIE, OSA, LIA and IAPLE, a guest professor of Osaka University and Tokyo Denki University. Prof. Koji Sugioka has published more than 200 peer-review journal papers, two books and 12 chapters in English and 26 chapters in Japanese about laser processing, also licensed 19 patents and was awarded 19 international and national awards. He was awarded doctor honoris causa by Szeged University in Hungary in 2018. Dr. Dongshi Zhang obtained his PhD degree from Xi'an Jiaotong University in 2014, soon after he joined Prof. Stephan Barcikowski group, Technical chemistry I, Duisburg-Essen university, Germany to do a postdoctoral research. In 2017, he joined Prof. Koji Sugioka group to pursue his postdoctoral study on preparation, manipulation and application of nanomaterials and nanostructures developed by laser ablation.